It all started at Starbucks... side glance here... quick look there... Corie was working for a local tv station where they would broadcast their morning show live near Starbucks. Thor and his colleagues from a local architecture firm would make their daily walk to Starbucks for a quick pick me up. Corie & Thor admired each other from a distance for months... until one day, their timing worked out and they no longer had to admire each other from afar, but instead, got to share time together... in front of Starbucks. Some our loyal blog readers have been asking to get some shots of us in action since we shoot as a team. Bobbi+Mike are some of our favorite photographers and they do this all the time, so we're going to try to add in a little more of setup along with the results. I was lookin' pretty good for this shot since I just got done lying on the ground for another shot... and I'm pretty sure I had some old gum stuck to my pants too. 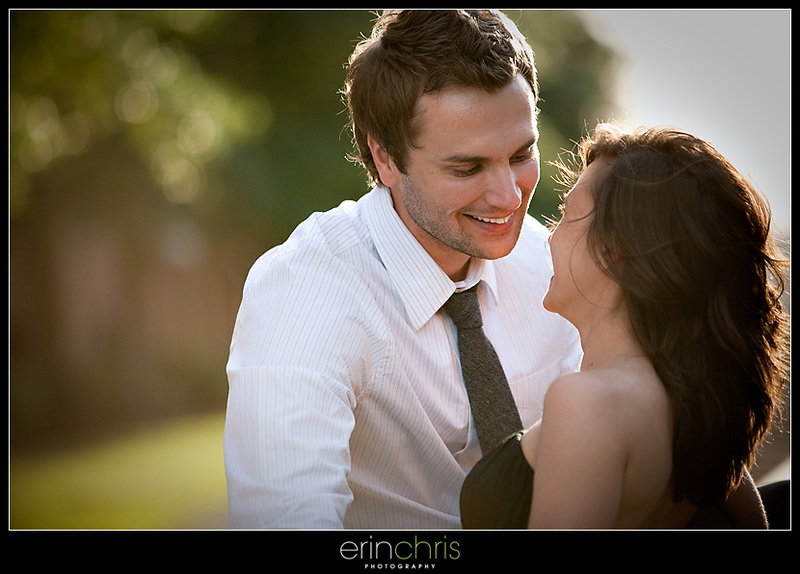 ;) It's okay though, Corie and Thor looked good enough to make up for us. What I saw from my angle was nothing short of hot. Yummy warm light plus happy good looking people = sweeeeeet. Everybody loves a trolley! We hopped on for a few quick shots at the end of the shoot. 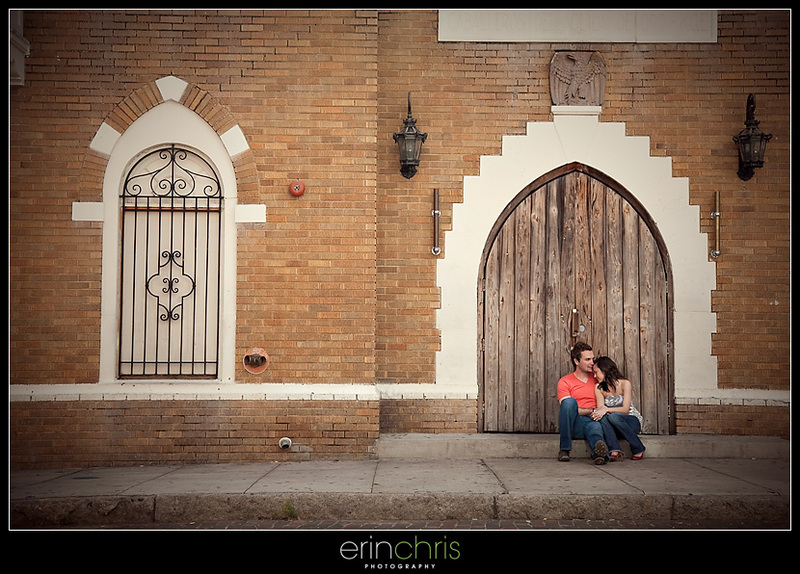 Corie and Thor, we had a blast shooting your engagement session. We can't wait to hang out with you guys again at the wedding! What a beautiful couple! 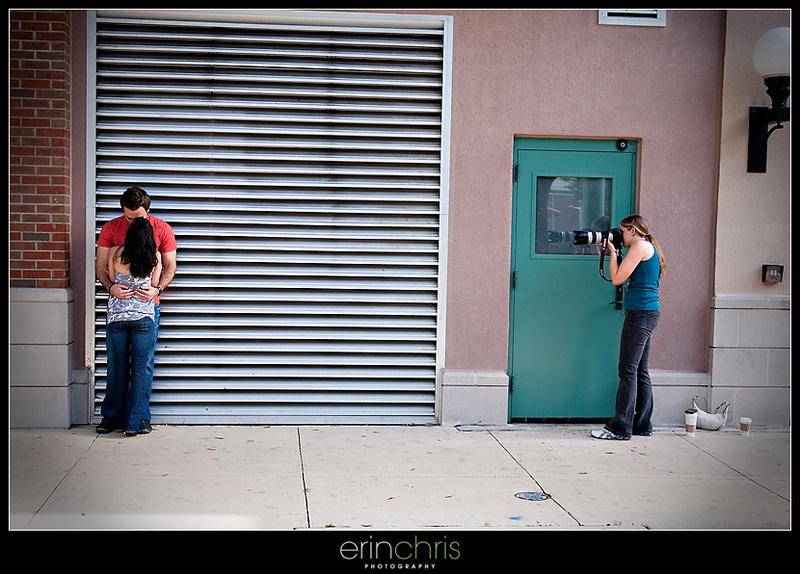 Thanks for showing the setup--it is really awesome to see what a great image you created from... is that a garage door? I also really like the next one, and then the second one after that--lovely lighting and a great moment! Hey! These look awesome. Not as good as the ones you took at my wedding, but still great, lol. I'm glad things are working well for the couple and for you. Have fun with all the Alumni at the wedding! Love the behind the scenes shot. Awesome session. Beautiful couple! One of my favorite sessions here! 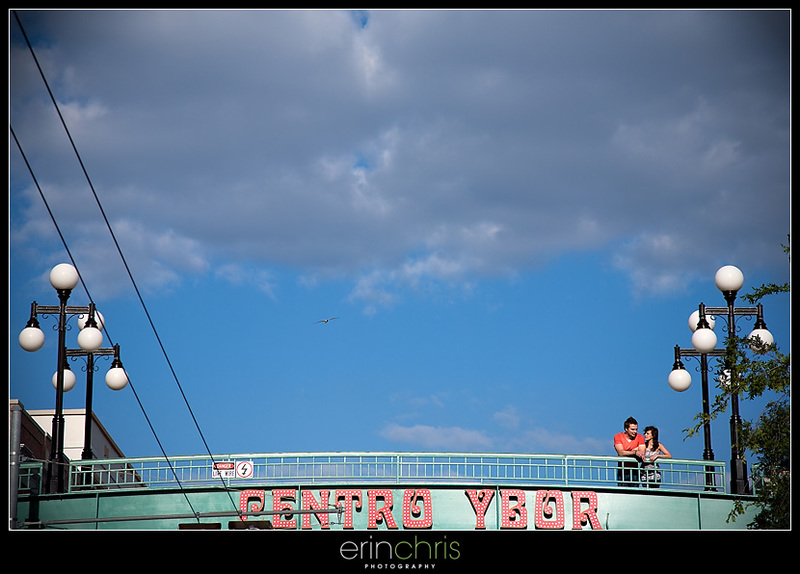 Nice to see you showing off your compositional eye! The lines, thirds, subject placement, and symmetry look fabulous. Must be the creative engineer in you guys =) #3,4,5 & 6 drew in my eye well to the subject matter. 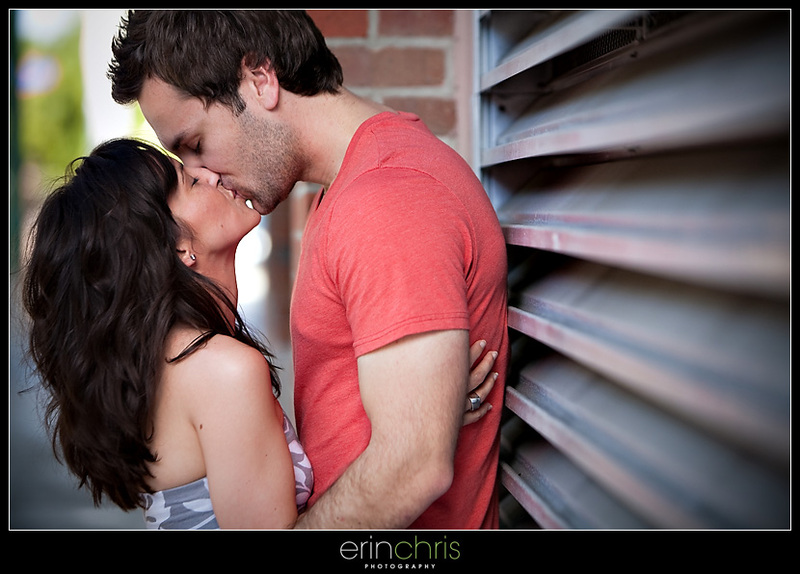 Nice work with leading lines and close ups of the couple. Great job with all of 'em! Love the backlighting! Gorgeous session! 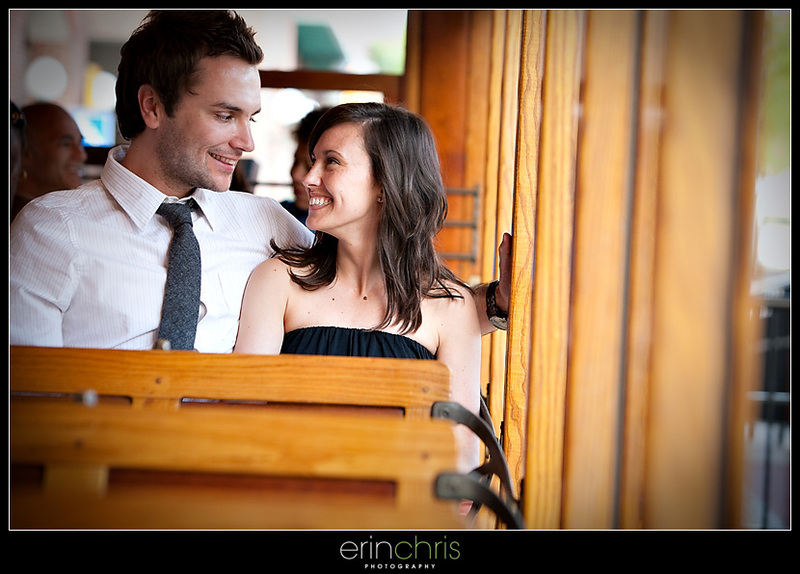 Great images and I love how you captured the romance of a couple about to get married. How fun for them to look back 50 years from now and remember the love they started their marriage with. wow great shots and use of the locations. the trolly one is wonderful!! Gorgeous session! Nice work with close ups of the couple.